April 13 , by Katrina. There has been a lot of chatter in the blogs lately about reusing materials and using up our stashes of goodies. So this might be an excellent project to try out this new trend for frugality. 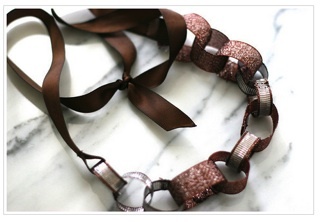 This DIY Ribbon Necklace tutorial comes from Prudent Baby and is fun and easy to follow. You could make a necklace with your kids, with left over ribbon from presents, to keep celebrating that birthday or holiday. Or you could make one for yourself as a fun way to use up ends of spools from your own wrapping or stash.